Status: Fairly common regular breeder southwestern Panhandle. Fairly common regular spring and fall migrant southwestern Panhandle, rare casual elsewhere. State listed as Threatened. Documentation: Specimen: HMM 3053, 7 Apr 1917 Whitman, Grant Co. Most spring sightings of Mountain Plovers in Nebraska are likely of arriving local breeders; true migrants heading further north to Wyoming or Montana are probably very rare as far east as Nebraska. The species is accidental in South Dakota (Tallman et al 2002). Most of the total Nebraska reports are in spring, in the period 24 Mar-16 May, with an earlier date of four on 18 Mar 2004 Kimball Co (Bly et al 2008). The only reports away from Kimball Co are 7 Apr 1917 (specimen cited above), two southeast of Sidney, Cheyenne Co, 17 Apr 1998, and a sighting at Clear Creek WMA, Keith and Garden Cos 21 Apr 1989 (Rosche 1994). Approximately 30-40, primarily adults, have been banded annually in Kimball Co since 2010 as part of numerous research projects. Usually, 5-10 birds are re-sighted annually; unique color-leg bands identify the individuals. In 2016, the first juvenile survival record occurred; a 20-day-old chick banded in Kimball Co 5 Jul 2014 with a unique leg-color combination was photographed and confirmed to be the same individual 23 Apr 2016, now a two-year old adult. It was found on a farm field within one mile of where it hatched in 2014 (Angela Dwyer, personal communication). High Counts: 9 in Kimball Co 23 Apr 2016. 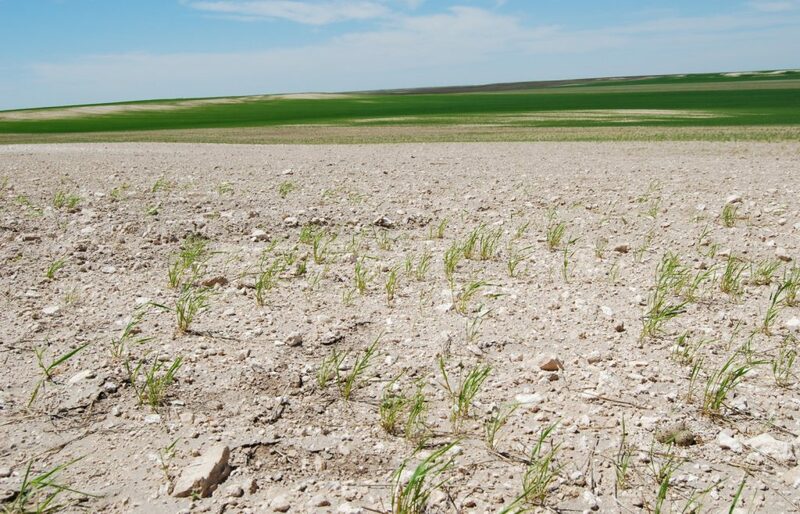 Summer: Mountain Plover breeding range has been affected by conversion of extensive unfragmented areas of native mixed- to short-grass habitat to various agricultural uses. As part of this conversion, grazers like bison and prairie-dogs that had kept the vegetation short and opened up areas of bare ground, were removed (Stephen J. Dinsmore, personal communication). Before settlement by Europeans, it is likely this species bred over large areas of the Panhandle, including Cheyenne, Dawes, and Sioux Cos (Bruner et al 1904). Still earlier, when bison grazing maintained short grass prairies considerably to the east, at least one breeding occurrence was recorded from Lincoln Co 8 Jul 1859 (Coues 1874; Ducey 1988), and specimens were collected in 1856-57 at the “Loup Fork of the Platte”, presumably in present Platte Co (USNM 9043, 9044; Coues 1874). We have been unable to locate these specimens. Very little was known about this species in Nebraska until the 1990s when nests were found in two general areas; a grazed native prairie about seven miles west of Bushnell, Kimball Co, and stony, freshly-disked fallow wheat fields and overgrazed pasture southwest of Kimball, Kimball Co. West of Bushnell, young were found 7 Jun 1975 (Lock 1975; Bennett 1976), three “less than half-grown young” 18 Jul 1983 (Cox 1983), a nest with eggs 21-23 May 1990 (Clausen 1990; Grenon 1991; Johnson-Mueller and Morris 1992), and a nest with eggs 18 May 1995 (Dinsmore 1997; Gubanyi 1996). Subsequent research (Bly et al 2008, van der Burg et al2001) and additional observations (Brogie 1997) showed most Mountain Plovers in Nebraska were using agricultural lands south of Interstate Highway 80 in Kimball and western Cheyenne Cos; most sightings since 1995 have occurred in this area. Nests with eggs were located 1995-2003 in the period 11 May-16 Jun (Sharpe et al 2001, Bly et al 2008). Most of our current knowledge of Mountain Plover in Nebraska has come from extensive field work carried out 2002-2016 in the southwest Panhandle by Bird Conservancy of the Rockies (Bly et al 2008). A total of 278 nests were found 2002-2007, all but six in agricultural fields, primarily dry-land wheat or millet (Bly et al 2008). The highest nest count during the study was in 2007, when 111 were located, most in Kimball Co, but also in Cheyenne and Banner Cos; nest success was 85%, with losses due mainly to predation and cultivation. Additional research showed chick survival in agricultural fields to be 0.52 ± 0.08 during 2010-2012 (Angela Dwyer, personal communication). Conservation efforts involved working with landowners to locate and mark nests so they could be avoided during tillage operations. Bird Conservancy biologists and farmers have found and marked 970 nests, averaging more than 70% hatching success from 2001-2016 (Angela Dwyer, pers. comm.). Bly et al (2008) delineated the Nebraska breeding range of Mountain Plover as mapped; within this area the breeding population was estimated to consist of as many as 180 pairs using the 106,000+ available acres of dry land wheat and millet fields (Bly et al 2008). Following a severe storm in spring 2010, adults and failed breeders had segregated into two groups by 1 Jul, failed breeders, and adults with broods. The presumed failed breeders were in small groups of 5-7, at least three weeks before flocks usually form, and by 21 Jul these flocks had increased in size to 15-20 birds. As of 28 Jul, 23 adults were still being tracked, 14 of which had young, several of which had reached flight stage (Bart Bly and Larry Snyder, personal communications). Knopf and Wunder (2006) stated that on the southern Great Plains, most plovers leave the breeding grounds in mid- to late Jul, with few remaining into early Aug, and Faulkner (2010) noted that Mountain Plovers “begin to concentrate in late Jul at staging areas where dozens of birds may stay for several days”. As of 2001 there had been only six records in Nebraska after Aug, including a specimen taken by Mickel in Dawes Co 27 Sep 1920 (Brooking, Notes). Since then however, flocks have been found lingering into late Sep (Larry Snyder, personal communication). True migrants from further north may account for some of these observations, but there are no banding data confirming this (Stephen J. Dinsmore, pers. comm.). Flocks reported in Nebraska include 10 fledglings in Kimball Co 1 Aug 2002 (Bly et al 2008), a group of nine in Kimball Co 28 Aug 2010 (Bly et al 2008), a flock of 42 that landed in a wheat field being planted in Kimball Co 30 Aug 2009 (Larry Snyder, pers. comm. ), 28 birds, mostly juveniles, in Kimball Co 31 Aug 2006 (Bly et al 2008), a flock of 78 adults and juveniles in Kimball Co 3 Sep 2007 (Bly et al 2008), and 40 in Kimball Co 23 Sep (Larry Snyder, personal communication). Easterly were two in Deuel Co 16 Aug 2006. Mountain Plover nest (lower right hand corner) in an agricultural field in Kimball Co 28 May 2009. Photo by Joel G. Jorgensen. Stephen J. Dinsmore and Angela Dwyer reviewed an earlier draft of this species account and provided numerous helpful comments that improved the content and composition. Photograph (top) of a Mountain Plover in Kimball Co, 10 Jun 2003, courtesy of NEBRASKALAND/Nebraska Game and Parks Commission. Bennett, E.V. 1976. 1975 Nebraska nesting survey. NBR 44: 8-11. Bly, B.L., L. Snyder, and T. VerCauteren T. 2008. Migration chronology, nesting ecology, and breeding distribution of mountain plover (Charadrius montanus) in Nebraska. NBR 76: 120-128. Clausen, M.K. 1990. Mountain plover sighted in Kimball County. NBR 58: 98-99. Cox, T. 1983. Mountain Plover. NBR 51: 94. Dinsmore, S.J. 1997. Mountain Plover nest in Kimball County. NBR 65: 131. Johnson-Mueller, N., and R. Morris. 1992. 1990 Nebraska nesting reports. NBR 60: 64-69. Lock, R.A. 1975. Young Mountain plover seen in Kimball County. NBR 43: 54-56.
van der Burg, M.P., B. Bly, T. VerCauteren, and A.J. Tyre. 2011. Making better sense of monitoring data from low density species using a spatially explicit modelling approach. Journal of Applied Ecology 48: 47–55. doi:10.1111/j.1365-2664.2010.01900.x.